The four-door sedan has been the default choice of most car buyers for decades, and while some automakers are shifting toward crossovers, sedans remain one of the best choices when it comes to practicality. Sedans offer enough passenger and cargo space for most people’s daily routines, especially since many people use their cars primarily for solo commuting. Less weight, a lower center of gravity, and better aerodynamic qualities than crossovers pay dividends in both performance and fuel economy. Though budgets will obviously define which tier of sedans you can peruse, there’s something special in every sub-set of four-door vehicles on the market. Below is our list of the best sedans for your shopping pleasure. The Honda Accord is many sedan buyers’ default choice, but with good reason. Along with its rival, the Toyota Camry, the Honda Accord has long been the default choice for a vast swath of U.S. car buyers. The name “Accord” is so associated with quality and reliability that Honda could probably sell them even if the seats were covered in spikes. But the latest Accord definitely earns its reputation. A recent redesign added some zest to the Accord, which is known for being both incredibly competent and somewhat dull. The new model borrows styling cues from the smaller Honda Civic, giving it a more stylish appearance that won’t offend buyers who just want to blend in with traffic. Honda also increased rear legroom and trunk space. Drivers will find plenty to like, too. The Accord is one of the few midsize sedans still available with a manual transmission, and you can pair that six-speed stick with the 2.0-liter turbocharged engine from the Civic Type R (base models get a 1.5-liter turbo four). You don’t get as much power (just 252 horsepower, down from 306 hp in the Type R), but the Accord can definitely get out of its own way, and take corners with poise. The Accord also represents a good tech value. Every Accord trim level includes the Honda Sensing suite of safety features (forward collision mitigation braking, road departure mitigation, adaptive cruise control, lane keep assist, and traffic sign recognition), as well as a backup camera. A 7-inch touchscreen display is standard; an 8-inch unit with Apple CarPlay and Android Auto compatibility is optional. Honda is back in a big way these days, but its best car might also be its cheapest. Honda’s all-new Civic isn’t just striking to behold, it’s also a return to fun-to-drive form for the Japanese automaker. With punchy turbocharged engines, nimble handling, and a smooth-shifting six-speed manual on offer, car shoppers looking for personality shouldn’t feel obligated to break their bank accounts. The sedan, coupe, and hatchback all bring the drama with aggressive exterior styling that, for its intended audience, is best described as “Instagram worthy.” Honda desperately needed a revamp after years of plain-jane Civics, and whether it’s the large air inlets on the front fascia, slender LED headlights, or wonderfully-contoured door panels, the 10th-generation Civic has the attitude its predecessors were missing. Inside, the new Civic can be optioned with the latest and greatest in safety and infotainment features to turn a compact commuter into a veritable entry-level luxury car. Apple CarPlay, Android Auto, adaptive cruise control, lane-keeping assist, automatic braking assist, haptic feedback controls … the list goes on. To top it all off, whichever motor you choose returns the best fuel economy figures in the class. Sometimes you get what you pay for — but in this case, you get more. Few sedans do luxury as well as the Volvo S90. The Swede doesn’t overwhelm its driver and passengers with an array of tech gadgets, but instead tries to create a calming, upscale experience. The interior features the highest-quality materials you’ll find this side of a Rolls-Royce, including wood that is not only real, but actually looks it. The portrait-oriented touchscreen is easy to use, and everything feels solid and well-thought-out. The S90 driving experience is best described as serene. The S90 is not a sports sedan, but its smooth ride makes it one of the best traditional luxury sedans around. It’s also fairly efficient for a big four-door, thanks to an engine lineup that consists entirely of 2.0-liter, four-cylinder mills, as well as a plug-in hybrid option. In the end, the S90 exemplifies the transformation Volvo has undergone in the last few years. It’s handsome, understated, refined, safe, and intuitive, and although it’s not the sportiest option on the road, it stands out in one of the most competitive segments in the industry. Alfa Romeo is essentially coming back from oblivion, and to do that, its first mainstream model in the U.S. in decades had to be epic. With the Giulia — particularly the high-performance Quadrifoglio model — Alfa has completely pulled it off. Building a rear-wheel drive sedan with an emphasis on sporty driving dynamics is a great way to start. Clothing it in gorgeous bodywork in the finest Italian tradition is an even greater idea. But Alfa went even further, bringing a nuclear weapon to a gunfight in the form of a 505-horsepower, Ferrari-derived 2.9-liter twin-turbocharged V6. The Quadrifoglio’s engine completely outclasses its German and American rivals in terms of power, and the Ferrari connection adds even more coolness. The Giulia Quadrifoglio is a sedan that thinks it’s a sports car. Want more proof? The Quadrifoglio managed to lap the Nurburgring in just 7:32.00, making it faster around the famed German track than the Pagani Zonda F and McLaren 650S. Mercedes-AMG and BMW M cars are so far in the rearview that they’re not even in the equation at this point. 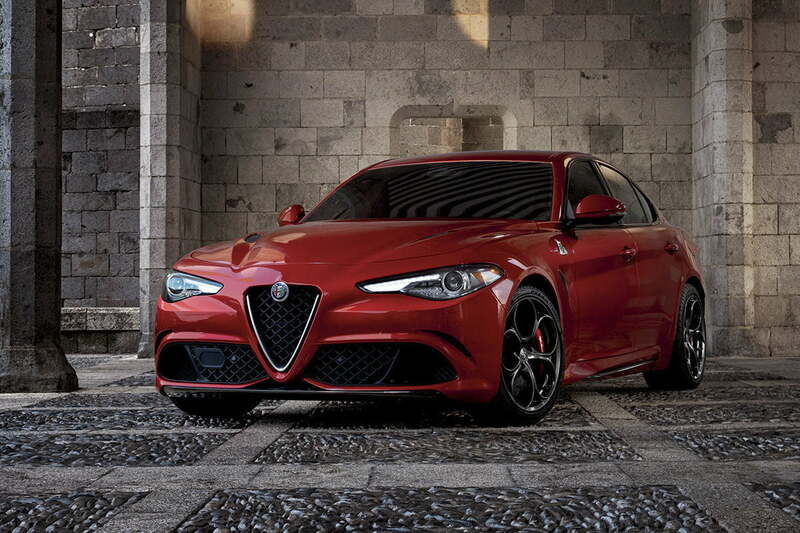 If it’s a sedan with bombastic performance you want, look no further than Alfa. Even if you don’t live the Snow Belt, the Subaru Impreza is worth a look. Many buyers turn to crossovers because of their available all-wheel drive, but the Subaru Impreza has that covered. While all-wheel drive is a Subaru signature, there’s plenty about the Impreza to recommend besides its ability to handle snowy roads. Other compact cars (like the Honda Civic) offer sharper handling, but the Impreza is no slouch in the bends. Thanks to its new Subaru Global Platform underpinnings, it compares well with the competition on refinement. The only available engine is a 2.0-liter boxer-four, which produces 152 hp and 148 lb-ft of torque. Base models get a five-speed manual transmission, while other trim levels get a continuously variable transmission (CVT) in the name of fuel efficiency. The standard 6.5-inch touchscreen is placed within easy reach from the driver’s seat, and Subaru offers Apple CarPlay and Android Auto compatibility standard. The Impreza is also available with Subaru’s EyeSight bundle of driver aids, including adaptive cruise control, autonomous emergency braking, and lane departure warning. Combine that with a reputation for bulletproof reliability and the Impreza adds up to a great sedan, even if you don’t need all-wheel drive. The Digital Trends automotive team tests vehicles through a comprehensive scrutinizing process. We examine the qualities of the exterior and interior and judge them based on our expertise and experience in the context of the vehicle’s category and price range. Entertainment technology is thoroughly tested as well as most safety features that can be evaluated in controlled environments. Test drivers spend extensive time behind the wheel of the vehicles, conducting real-world assessments, driving them on highways, back roads, as well as off-road and race tracks when applicable.